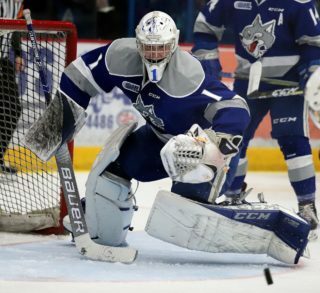 The Sudbury Wolves will jump back into pre-season action this week with a pair of home games before wrapping up exhibition play on the road on Sunday. The Wolves will kick things off Wednesday night when they host their Central Division rivals, the North Bay Battalion at 7:05pm. They will then return to home ice on Friday to host the Sault Ste. Marie Greyhounds in the first of a home and home series at 7:05pm, before completing it on Sunday at 2:07pm in Sault Ste. Marie. Wednesday’s game is sponsored by 92.7 Rock, while Friday is sponsored by KiSS 105.3. The Wolves are currently without the services of Michael Pezzetta (MTL), Jake McGrath (BUF), Dmitry Sokolov (MIN) & Macauley Carson (SJ) who are all away at NHL camps. Tickets are on-sale now at the Sudbury Arena Box Office, online at greatersudbury.ca/tickets or by calling 705-671-3000.